I Have Become Dora the Explorer: Help Me Please - Are You Finished Yet? There are many people in this world I have tried to emulate, but I never thought Dora the Explorer would be one of them. Yet, that is exactly who I am about to channel, at the risk of sending half of my readers running from their computers (because, duh, kids shows are annoying). So you know how good old Dora is always asking your kids to help her get someplace like Carnival Town to deliver piñata cookies to the Big Red Chicken? And all along the way she wants your kids to count the hills they need to climb. Or yell “Swiper, no swiping!” to keep that sneaky fox from stealing Dora’s talking backpack, filled with random things that would never be useful on any normal voyage, but somehow get her out of the strangest of pickles? Well, according to Dora, she couldn’t complete any of those adventures without your kids. I usually call her bluff on that. Last time I checked, she still made it past that grumpy old troll even when my kids failed to count to five in Spanish. However, I am going to take a page out of Dora’s book today and ask for help…and it’s not with something lame like bringing the moon down to the King and Queen of Chocolate Land. (I mean, it’s pretty cool that they are in charge of the chocolate and all, but ain’t nobody that important to claim rights to the moon. Get a backbone, Dora, and say “no” every once in a while.) But unlike Dora, who requests aid she doesn’t actually need, I DO need you to hold up your end of the bargain. My grumpy old troll is much less of a pushover than hers. Here is my request: Will you help me get to Wider Audience Reach Land? While I am incredibly thankful for the growth this blog has seen over the last few years, and I am feeling pretty good about book sales for Absolute Mayhem, there are certain forces coming together which make it harder and harder for me to reach new audiences. I can only ask my friends to buy so many copies of my book. And, while I find laurels to be extremely comfortable and easy on my lower back, I have been told I can’t really rest on them. The good news is there are things that can be done to remedy this situation. Yet it has also become very clear that I can not find all the new markets by my efforts alone. I wish I could. That’s where you come in. 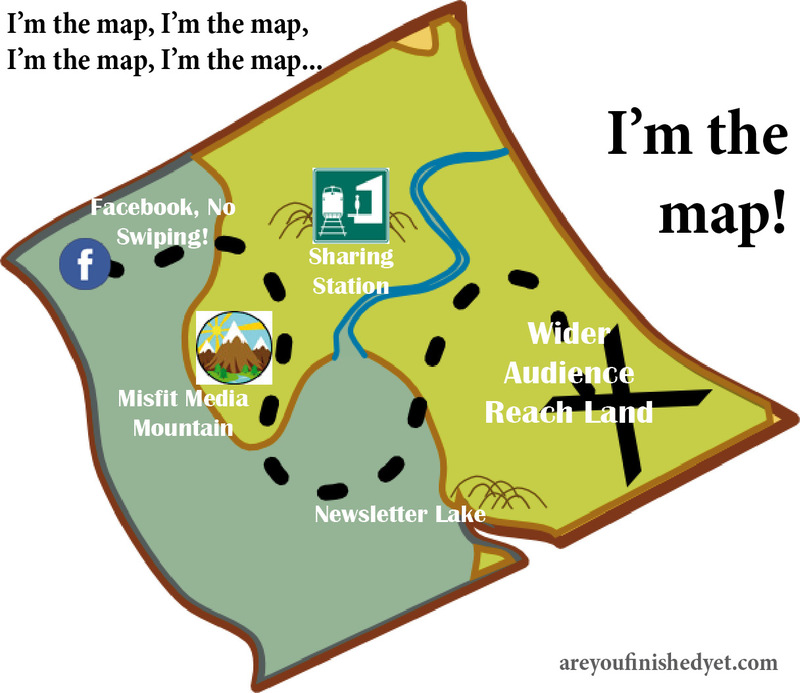 So let’s take out our map and see how to get to Wider Audience Reach Land. 1. First, tell that sneaky Facebook to stop swiping: It seems that sneaky social media platform, Facebook, has swiped a nice chunk of people who used to see my posts with something called an algorithm, or as Dora would say, algoritmo. Can you say algoritmo? Sure you can. But instead of yelling, “Facebook, no swiping,” at your computer screen – which would be about as effective as your kids telling Dora which door to open – let Facebook know my posts are worth seeing. When you see a status update or post from the Kelly Suellentrop Author page or the Are You Finished Yet? blog page, it would be extremely helpful for you to hit that little LIKE button and/or leave a COMMENT. The more likes and comments a post gets, the more people sneaky Facebook will show it to. That’s how it works. Now, I’m not asking you to compromise any standards for what deserves the “like” button; if you didn’t enjoy the post, you don’t need to pretend you did. However, if it seems “thumbs-up-worthy,” that two second click could get me one step closer to Wider Audience Reach Land. 2. Next, stop off at Sharing Station: If you feel so moved, SHARE my posts and announcements about my book, Absolute Mayhem. Doing so is just about equally as important as reading them yourself. For someone like me, who is her own publicist and marketing exec, WORD OF MOUTH is to me like Boots the Monkey is to Dora. It’s my very best friend. And it’s a proven fact that people are more willing to read a blog post or check out a book if it is recommended by someone they know. Just think of yourself as Diego, aiding Dora in her time of need – like when Baby Jaguar is stuck in a tree, dangling off a cliff. There are many ways you can do this. You can use the handy-dandy sharing buttons at the bottom of each blog post. You can share a post directly from Facebook. You can retweet one of my tweets. Or you can stand in a public square and recite my work for anyone passing by. But I don’t really recommend that last one. I have yet to hear of a blog post going viral by way of town crier. 3. Follow the Path to Misfit Media Mountain: Facebook may still be “Numero Uno” when it comes to social media for many people. But did you know you can connect with me elsewhere on the internet? Lately, I am really diggin’ Instragram (my account is pretty adorable, thanks to my kids) and LinkedIn (where I’ve totally been snazzing up my profile and publishing all my blog posts), so I would love for you to check me out there. You can also find all my blog posts on Google+ and Pinterest as well. And Twitter? Twitter is pretty much like Yo Gabba Gabba in my book. Lots of people seem to really like it, but I don’t totally get it. Still, I am doing my best to say active, even though my humor seems to be too long-winded for the tweet. 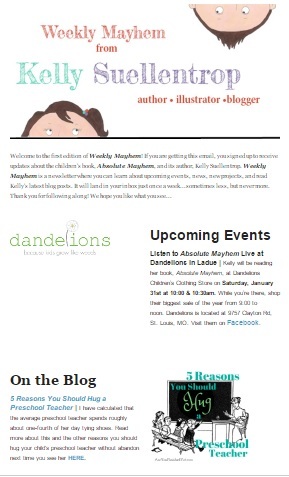 A little snapshot of the email newsletter. How cute would this be in your inbox? 4. Finally, find what you’re looking for at Newsletter Lake: As a way to combat the fickle nature of social media, I have decided to start an email newsletter called Weekly Mayhem. By subscribing, it helps ensure you aren’t missing any new posts, event announcements (of which I have some coming up! ), or book updates because of that sneaky Facebook not showing you my statuses or Twitter being all ADHD. The newsletter contains links to posts, news about book signings or story times, updates on new releases, fun facts, quick sketches or doodles…basically anything going on in the world of Kelly Suellentrop/Are You Finished Yet. It will land in your email inbox AT MOST once a week. All you need to do is go HERE and pop in your email address. Boom. You’re done. Let all the Mayhem come to you. So, we told that sneaky Facebook to stop swiping, we stopped at Sharing Station, we followed the path to Misfit Media Mountain, and we found what we were looking for at Newsletter Lake. That means we made it to Wider Audience Reach Land! Yay! We did it! Aaaand now you have that high-pitched “We Did It!” song stuck in your head for the next five hours. My sincere apologies. To sweeten the newsletter deal, everyone who signs up for Weekly Mayhem between now and next Tuesday (February 10th) will be entered to win your choice of 1) a Lulu & Milo mouse pad (choose from 3 designs! ooooh!) OR 2) an autographed copy of Absolute Mayhem. Just click HERE to enter. Look at these fabulous prizes. One could be yours if the price is right. And by price, I mean subscribe to my newsletter. Thank you in advance for helping a girl out. Part of me feels a little slimy goin’ all Dora the Explorer on you, but as I just reminded my daughter after her last basketball game, you miss 100% of the shots you don’t take. 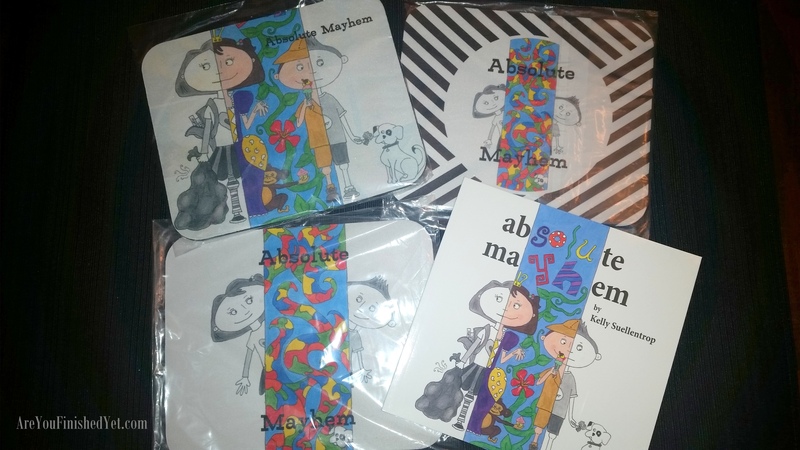 Hopefully the number of people I encouraged to help me spread the word about Absolute Mayhem and this blog is greater than those I annoyed with my thinly veiled begging attempts….and greater than the number of baskets my daughter made at her last game. Just think, the more you can do this for me, the less I have to ask. And I really hate asking. Like, I literally just stress-ate an entire bag of chips and a whole bowl of guacamole while writing this post. I feel worse than if I had just watched a Dora the Explorer marathon. Don’t want to miss a post? Want to stay updated on my author events and news? Subscribe to my Weekly Mayhem Newletter HERE! Customers who like this blog also follow me on Facebook, Twitter (@RYouFinishedYet), Instagram, and Pinterest. It’s Time to Close the Internet. Everything Has Already Been Written. Thank you so much! You just made my day! So creative! Love this and happy to meet you! I’m following on instagram now too! Thank you! I just followed you as well! Always nice to connect with new people. Have you considered making an audio version and submit it to the National Library or The Division of Blind Services? I ask because they are always looking for new children’s books. That is an area of need in the audio division. Grandparents want to enjoy stories with their grandchildren, blind or visually impaired children want to read the same books that classmates can, and teachers of visually impaired classrooms need fresh and current books to deliver. That is a fabulous idea I had never thought of! Do you know how to go about doing that? Thanks so much for the suggestion! I really appreciate it! It’s a federal program so probably looking up any library and inquiring or you could call The Division of Blind Services in your area. Have you tried setting up your blog to be read on Amazon? Some people say that it has helped them. Thanks for the suggestion! You’re awesome. I do have my blog on my Amazon author page. I haven’t seen much traffic from it, but you never know! Your blog is delivered to my email and I love it, but I don’t even know how I managed that! This is asking a lot of a tech dinosaur, but you know I would do most anything in the world for you so —- I will call the tech guys and tell them to come right up to help me! Oh, I could just come through the computer screen and hug you 🙂 ANY support of any kind is awesome, and you have given me much. I am so grateful to have wonderful people like you cheering me on. Thanks! I’ve been reading way too much about social media engagement and reach. It’s exhausting…hopefully some of it pays off.